The last of three chapters that tell the story of the 1902-03 season, such was the significance of events in the final campaign under the Argyle FC name. In this chapter, Argyle Football Club played its last games, culminating in the 'Devon Double', and after considerable effort, Plymouth Argyle Football Club won its places in the Southern and Western Leagues. 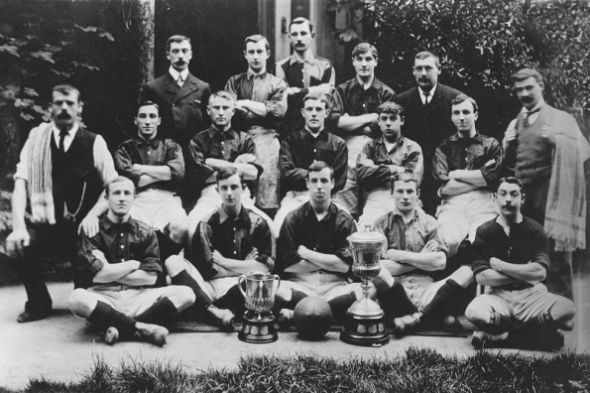 1.1: an improved image for the 1902-03 team photo. The meeting decided that these arrangements by the Manager be carried out. The meeting also decided that Mr. Brettell shall put an advertisement in the ‘Athletic News’ on the 1st May 1903, the first day after the close of 1902-03. The Secretary was instructed to write to the Albion and Plymouth Rugby clubs for their 1903-04 fixture lists to try to avoid fixture clashes. As soon as the Company was registered, they would apply to join the Devon F.A. and enter the F.A. Cup. John James 'J. J.' Bentley of the Football League had accepted his invitation to Home Park on the 25th April and Brettell was to ask him to bring a referee. The various regular meetings of the Directors were private and no newspaper reporters attended. Very little news of developments was released to the local press. This may be because there was no reason to issue news until admission to the Southern League was secured and the negative reactions of the other local association and rugby football clubs. Mr. Spender of the Western Morning News spoke against the arrival of professional League football but the other local newspapers were not against. Elsewhere in the country, the London and Provincial newspapers were showing great interest in the Plymouth developments. Plymouth Argyle had captured the imagination of the general public nationwide, whilst locally there was hostility. The Football Mail in Portsmouth reported on Saturday 4th April 1903 that, “The formation of Plymouth Argyle F.C. has created such exceptional interest”, and the newspaper regularly updated its readers on the subject. Manchester’s nationally read ‘Athletic News’ had speculated that Plymouth Argyle was seeking admittance into Football League Division Two. The Football Mail informed its readers this was incorrect; the new club was seeking admission to the Southern League but Argyle were encountering opposition. The report continued that even Bristol Rovers was against because of the additional expense “in visiting such an out-of-the-way spot”. The Midland clubs, plus New Brompton and one or two of the Metropolitan teams “intend to hold out for a substantial monetary inducement before favouring the application”. Thankfully “money is not scarce in the Western Port” said the Mail. A visit to Plymouth would be a three-day jaunt for most clubs and little or no profit would come out of it. The northern press had reported “startling” stories of “poaching” of well-known players by the new club. The midland press had reported that the famous player, Charles Athersmith, had sold his licensed house to join Plymouth Argyle. Whilst it was illegal to sign players before May 1st, the Portsmouth newspaper reports that players were “marked down” and at Portsmouth in 1899, Frank Brettell had signed eight or nine players before the day was ten minutes old! The Football Mail thought Brentford, Watford and Wellingborough were inferior clubs, not good enough for the Southern League, and the other clubs should vote Plymouth Argyle in and them out. The Plymouth Argyle Directors meeting on the 6th April 1903 confirmed the problem with Bristol Rovers who, as the nearest Southern League club to Plymouth and the one who had recently made the journey for a fixture, could influence the others. Frank Brettell reported he had again met the Bristol Rovers directors and the interview was “not satisfactory”. Brettell had settled with Swindon Town to receive their support for a £10 inducement, whilst Reading wanted a fixture on either Christmas Day or Good Friday during the 1903-04 season. Reading got what they wanted more or less; the 1903-04 Southern League fixtures between the two were later arranged as, at Home Park on Christmas Day 1903 and at Elm Park on Easter Monday 1904. In the event, the significantly higher crowd attendances at both matches may have rewarded Reading financially better than an inducement sum. The Devon Wednesday Cup was set up but there were only six entrants. The meeting to do so was held at the Argyle Athletic Club rooms, and the pervasive anti-Argyle mood may have accounted for the fact that the only civilian clubs who entered were Argyle and Crownhill. Both were drawn against each other in the first round, which Argyle won 9-1 on the 11th March 1903. The next round was the semi-final against the North Lancs Regiment on Wednesday 1st April 1903 at South Devon Place. Charlie Hare played for Argyle Wednesday at centre-forward and Clifton Pethick was at centre-half, but the rest of the team were different from the Saturday regulars. Most of the Wednesday players were in the retail shop trade, playing on their half day off, whilst Clifton Pethick, being a member of a wealthy Building Contractor family, could play as he pleased. The North Lancs Regiment got their revenge for being knocked out of the Devon Senior Cup by Argyle, as they won 2-1. They went on to defeat the Border Regiment in the final. The final of the Devon Senior Cup between Argyle and Tavistock took place at South Devon Place on Saturday 4th April 1903. Argyle had reached the final three times in the previous four seasons and had failed to secure the Cup in all. This was their last chance as the Argyle Football Club. Charlie Hare, confident in Argyle’s defence, put himself at centre-forward as he had done in every match since the end of February. The rest of the team was Argyle’s strongest and it showed, especially in the first half. Although the weather was “miserable and dirty”, a crowd of 6,000 attended. Despite a very slippery surface that made keeping your feet difficult, Argyle’s passing was “exceedingly neat”. After only five minutes, the score was 2-0, and at twenty minutes Argyle were 4-0 up with two goals from Hare and two from Moore. The Western Daily Mercury reporter, on describing the second goal, pushed artistic license too far when he called Argyle the “Scotchmen”. With Hare bossing the game, Argyle’s assured play prevented Tavistock posing any danger. Tavistock’s most industrious forward, the Reverend Hawkey, was limited to sporadic opportunities. With the score 4-0 at half time, Argyle took their foot off the gas in the second half which allowed Tavistock back into the game. Coming under pressure, Argyle woke up and Charlie Hare, with a beautiful shot scored the fifth goal to complete his hat-trick. 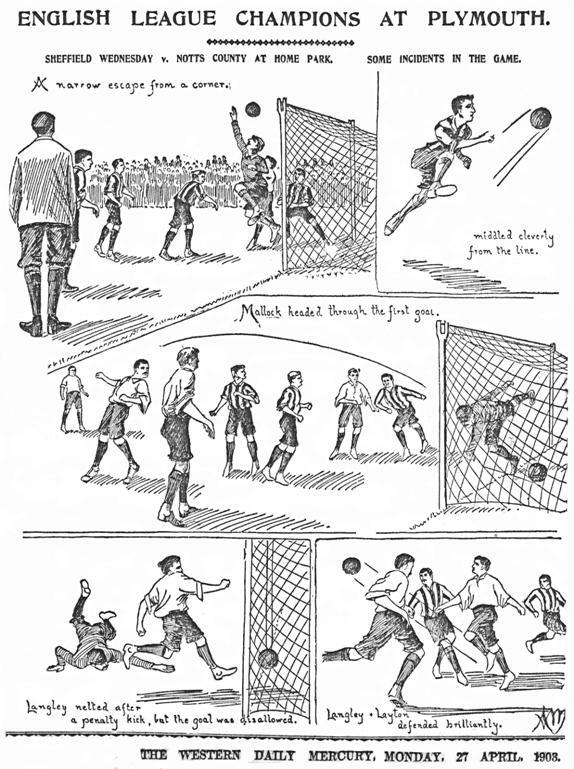 The rest of the game became very tame until the Reverend Hawkey broke away to score a consolation goal for Tavistock amidst great applause from the crowd who had been backing the ‘underdog’. Argyle had won the Devon Senior Cup for the first time, 5-1. The club was very happy with its achievement. The Football Herald had the highest of praise for the Argyle victory. It said that no one should grumble at the result and Argyle’s display gave full value for the entrance money. The crowd were unanimously behind Tavistock, even the Plymouthians. Argyle came onto the pitch at the beginning to a “faint cheer”. The newspaper says the result was a foregone conclusion after only five minutes but gave Tavistock credit for “sustaining a waning interest right up to the finish”. The reporter likened Argyle’s play to that of the professional teams that had visited Home Park. He also jumped on the Scottish bandwagon by calling Argyle “the Tartan named brigade”. The name was gaining a fascination it did not have when the club was just a local amateur organisation. In difficult conditions, the training and fitness of Argyle was very evident. The greasy mud did not upset them and the players kept the ball under their control. They played as a team; the forwards assisted in defence as soon as the ball was lost. In praise of the Coach, he was accorded the title “Professor Hare”. The Football Herald ended their report “Association football locally is certainly on the upward grade, and the great difference in our present champions, as shown by their exhibition on Saturday, as against our previous winners undoubtedly goes to prove this. May it continue so”. The astute writer is possibly Windrum who gave a clue to his identity in the Football Herald a week later. The Argyle Football Club had seven fixtures still to play in April but faced them in much better condition, mentally and physically, than the same period the previous season. The last match in the two season ‘professional’ programme pitched Argyle against a likewise ‘senior’ club from Essex, Ilford. Founded in 1881, Ilford had won the Essex Senior Cup for the first time in 1888 and again in 1889, 1890, 1892. In the Easter holiday, on Friday 10th April 1903 at Home Park 4,000 attended. Green Waves had arranged a competing fixture at South Devon Place against Lancashire County; a similar sized crowd went to the 0-0 draw. Argyle were able to put out their strongest team again, the same XI that had won the Devon Senior Cup. They exhibited the same fine passing game as that against Tavistock and put the visitors under pressure. Pethick crashed the ball against the upright from twenty yards and Wheaton shot over the bar. Charlie Hare, marshalling as usual, sent the ball all over the park to teammates, initiating moves. Ilford had their chances, which were dealt with as both defences coped with threats on goal. The first goal was scored by Hare, a penalty, which made the score 1-0 at the break. In the second-half, Ilford strived to equalise and looked as if they had when Buchan fumbled, but the referee, former Argyle official George Vaughan, disagreed. Playing well, Ilford netted again but the referee gave offside. Argyle came back into the attack and Johnny Andrews headed a goal to put them 2-0 in front. Ilford pulled a goal back and play livened up. Hesitation by the Ilford backs let Johnny Andrews score his second goal. The match ended 3-1 to Argyle and the club must have been very satisfied with their progress. Hanna had been the captain of the very successful Portsmouth R. A. team under Frederick Hugh Windrum. 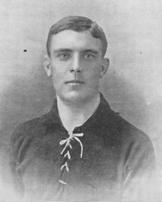 In 1899 he was capped for Ireland and made a couple of appearances for Portsmouth FC. On the 17th November 1897, the Portsmouth R.A. were in Plymouth and invited to attend the Argyle Smoking Concert at the Globe Hotel. The handsome Hanna, when called upon to sing a song, was too busy chatting up a chambermaid to oblige. The following day, Saturday 11th April 1903, after their Good Friday exertions, Argyle and Green Waves met at Home Park for the crucial Devon League encounter. The Argyle XI was unchanged and Green Waves contained their two forwards from the North Lancs Regiment, Daker and Ashcroft. The match finished with honours even, 2-2, witnessed by 1,500. Green Waves remained top with Argyle second. The ‘away’ League match at South Devon Place was only four days later. Pethick was injured in the first match and needed to be replaced. The ideal man was available and brought to Plymouth by Lieutenant Windrum for the Royal Garrison Artillery versus the Border Regiment in the Devon Wednesday Cup semi-final. There was a problem in that both matches were on the same day at two different venues. The player in question was Irish International, Sergeant J. D. Hanna who had played under Windrum for the Royal Artillery and Portsmouth in the Southern League. Argyle had gambled their whole League season on one man playing in two matches on the same afternoon, journeying as quickly as possible from Home Park to South Devon Place after finishing the first match. On Wednesday 15th April 1903, the Green Waves versus Argyle match kicked off late because it followed the Plymouth Rugby Club match versus Gloucester. Practically all the spectators of the rugby match stayed on for the most important Devon League match of the season. It was raining so the rugby match had churned the pitch up. Argyle lined up at the start with only nine men, beside Hanna journeying from the match at Home Park, inside-right Ernest Moore had failed to turn up. Green Waves were fully represented with Daker and Ashcroft in the front rank. With men short Argyle were put under pressure, their usual neat passing was replaced with long judicious kicks. After fifteen minutes, Hanna arrived at South Devon Place to strengthen Argyle, who were still without Moore. The artilleryman’s arrival gave Argyle the vigour to attack and they started to storm The Fishermen’s stronghold. The ball was quickly transferred from one end to the other. Argyle’s combination was improving though Buchan had more to do than the Green Waves 'keeper. Argyle were enjoying a spell of attacking when William Cleminson turned up to fill the place of the missing Ernest Moore at inside-right. Argyle had held on successfully for twenty-five minutes. Both sides attacked and Green Waves got the ball into the net with a shot that glanced off Hanna, accompanied by a tremendous shout from the large crowd. Luckily for Argyle, it was ruled offside. The energy and pace of the great rivals was terrific but caused the tactics to become kick and rush. The first half ended 0-0 with Argyle on top. They continued to press in the second half and chances came and went until the Green Waves goalkeeper left the goalmouth to intercept an Argyle rush. Before he could clear the threat, Cleminson and Archie Wheaton had rushed the ball into the net. “The success was greeted with a tremendous round of applause.” reported the Western Daily Mercury. Green Waves tried to fight back but Argyle remained on top and Johnny Andrews shot into the net for Argyle. The referee gave offside. More chances came the way of Argyle as they dribbled through the Green Waves defence causing the goalkeeper to rush out again. Green Waves, in all white, tried to make a final rally but could not break down the defence. The match ended 1-0 in one of Argyle’s most famous and toughest victories. It settled the argument, which was the best team in Plymouth and put Argyle above Green Waves in the League with three matches to play. There is the question - why were Hanna and Cleminson, who was not even in the original line-up, allowed to join the match late? On the same day, the Crownhill goalkeeper arrived late at Defiance and was not allowed to take his place. ‘Observer’ in the Football Herald (18-4-1903) wrote that he had known Hanna for many years, especially with the old Portsmouth R.A. Does this point his identity to be Windrum? He wrote of Hanna’s “grit” in playing in two consecutive football matches. Sergeant Hanna only arrived in Plymouth on the Tuesday night. The following afternoon he played for the R.G.A. versus the Border Regiment at Home Park. Heavy rain made conditions difficult. Soon after kick-off, Hanna, at centre-forward, notched the first goal. It was a strenuous 2-2 draw with the R.G.A. having to fight back from 2-1 down in the second half. At the end of the match, he rode a horse as fast as possible from Home Park to South Devon Place, where he arrived fifteen minutes after kick-off. He played at centre-half for a team he probably had not met before, helping Argyle in another tough match. ‘Observer’ said of Hanna’s feat, “it is truly remarkable; I know of no similar instance”. Just as remarkable was that of Fred J. Lillicrap, the outside-left of Green Waves. ‘Observer’ said he gave an “indifferent display, which was probably owing to his having played for Plymouth against Gloucester”. This rugby match preceded the association match. Lillicrap was a Devon County Association player who later became a Devon County Rugby player. Two of the Argyle players who played pivotal roles in defeating Green Waves were called up to play for Devon at Home Park on Saturday 18th April 1903 and played for the club in a League match immediately afterward. Devon played their final match of 1902-03 versus Cornwall, which kicked off at 3.10 p.m. In the Devon team were three Argyle players: Sid Wyatt, Tom Broad, and Clifton Pethick. 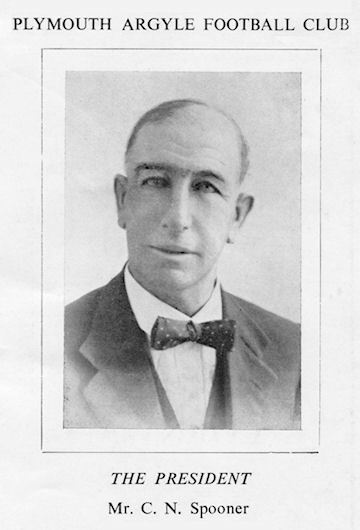 William H. Shearer of Defiance replaced Percy Buchan, the regular Devon custodian since 1895, in the County team. The goalposts at Home Park were constructed so they could be quickly converted from Association to Rugby for joint programme matches. The crossbar fitted into ‘Y’ shaped uprights for Association. A hard shot against the crossbar by Cornwall knocked it out of its grooves and it came crashing down onto the head of Shearer. There was a short delay, as he recovered. The match resumed and Devon won 5-1. Immediately this match finished, Argyle played Crownhill in an important Devon League Division One match. Wyatt and Broad, despite their exertions for the County, lined up in their club positions. The Irish International, Hanna, who had assisted against Green Waves, replaced Pethick. Other than Pethick, Argyle kicked off with their strongest team. Crownhill were mid-table and not in contention for the League title. Their players, unlike Argyle’s Wyatt and Broad, were all fresh, none having played for Devon. There was great excitement at Home Park as Crownhill gave Argyle “something of a fright by attacking in the most desperate and unexpected manner”, reported the Western Evening Herald. The word “unexpected” could have more than one connotation because as previously inferred in this history, some agreements or arrangements between friendly clubs were apparent at the end of season to assist title attempts, though no claim was ever alleged or proven. Crownhill were a close and only civilian ally of Argyle, so perhaps they were expected to ‘roll over’. Crownhill’s main threat, centre-forward Mason, was missing, and their defender Albert Ledington, who played for Argyle on Wednesdays, inexplicably picked the ball up in the penalty area but the referee chose to ignore it. This was in a part of the game that had been almost all Crownhill pressure. Aggravated by the decision of the referee, Argyle dramatically improved, leading to a goal from a fine shot by former Crownhill player, Archie Wheaton. This was the half time score. During the second half Hanna gained possession and placed nicely for Charlie Hare to head a clever goal; 2-0 to Argyle. The battle was fiercely fought to the end after Crownhill pulled a goal back. With two matches to play, the 2-1 victory kept Argyle above Green Waves, who were two points behind but had a game in hand. As it turned out the Argyle Football Club had one more match to play. Their League match against Lieutenant Windrum’s Royal Garrison Artillery, on Thursday 23rd April 1903, was conveniently conceded by the soldiers. The two points kept Argyle at the top with one match to play and put third placed Defiance out of the running for the League championship. However, the title was not yet won, though the tired Argyle players had a longer break before the final game. It is poignant to remind the reader of poor Arthur Worrall, who on the same Thursday appeared in Devonport Police Court and, perhaps, was sent to prison. Writing in the Western Evening Herald on the Tuesday 21st April 1903, the reporter ‘Observer’ informed that he knew the names of the professionals secured by Plymouth Argyle and the public would be very surprised at the “exceptional talent”. He said “at present, my lips are sealed”. To have the knowledge ‘Observer’ must have been Lieutenant Windrum as he was aware of Frank Brettell operating, on behalf of Plymouth Argyle, illegally before the May 1st date. His article continued with news he had seen in the Portsmouth Football Mail, and he described something he called “Trying an Old Dodge”. He said Windrum told him that players were using the Plymouth Argyle name as a threat to their clubs when invited to re-sign for 1903-04. “Several of the Villa players sprung the Plymouth wheeze upon the directors”. The Villa players were inferring an offer of better terms to go to Home Park, but they had not actually been approached. Mr. Ramsey, the Aston Villa Secretary, knew that Argyle had stuck to their promise not to take any of the Villa players. The Football Association, at the start of 1901-02, had brought the maximum £4 weekly wage into force, so better terms meant either an illegal bonus or a maximum legal £10 signing-on bonus. The Birmingham press had printed stories of “poaching” by Argyle. While this sounds like newspapers writing the news rather than reporting it, this does show how much interest the 'new' Plymouth club was generating and how important the club appeared to be. The impression was down to the publicity generated by Windrum, to make it appear so. How clever to build an impression and let people’s imagination take over and do the work for you. The apparition of Plymouth Argyle had become huge; how could anyone dare reject them? Of the sixteen clubs in Southern League Division One, fourteen had now pledged support, as long as Plymouth Argyle signed no Southern League players. This also applied to Southern League players released by their clubs. ‘Observer’ remembered Frank Brettell having to refuse good players at Portsmouth when they set up. Unmentioned was that Argyle were also paying an agreed inducement to most of the clubs. Plymouth Argyle was not a football club yet, until voted into a League, but it was by then a registered Company. 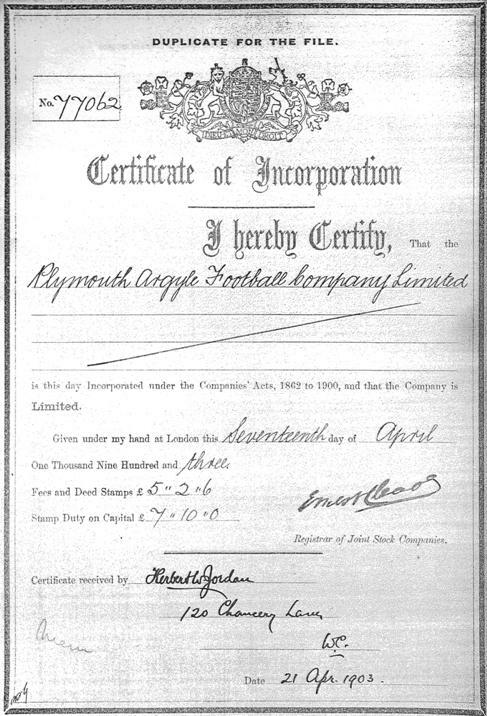 Plymouth Argyle Football Company Limited was granted its Certificate of Incorporation on the 17th April 1903 and received it on the 21st April. The Company is established as a legal body and recognised in law. Argyle were setting up the Sheffield Wednesday versus Notts County trophy match at Home Park on Saturday 25th April 1903 as if it was the F.A. Cup Final. The agreed attendance of J. J. Bentley (President of the Football League) and William Pickford (Football Association Council) to act as a linesman, and Mr. Bentley was bringing Jack Strawson, a top Football League referee, gave credence to the notion. The winners were to receive a silver cup and gold medals. Both of the Football League Division One clubs had played twice in the F.A. Cup Final during the 1890s, each winning once in that decade. The Great Western Railway was to run excursions from as far as Bristol and Penzance, and the London and South Western Railway from Exeter. 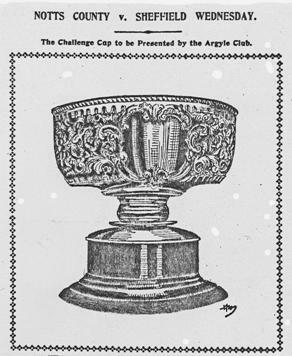 The demand for tickets was great and the cup was on display a week before in the window of sports shop Nichols & Co in Union Street. In reporting the real F.A. Cup Final at Crystal Palace that year, the Football Herald (18-4-1903) suggested that those who were prevented from attending the struggle should witness the match set up by the Argyle Athletic Club at Home Park. The game was billed as “unique”; it was not an exhibition game, it was a chance to see the ‘Cup Final’ without travelling to the Metropolis. 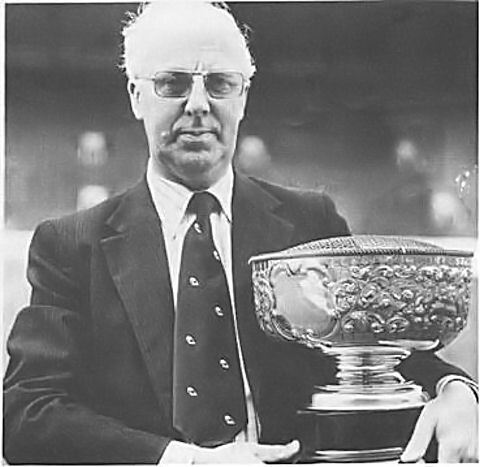 The match, for this trophy, was a masterstroke idea that, with the attendance of J. J. Bentley, focussed attention on Plymouth Argyle and Home Park. The publicity value was huge and acted as insurance in the election process into the Southern League that was coming up. The Argyle-arranged event was important enough for the President of the Football League, J. J. Bentley, to arrive in Plymouth on Thursday 23rd April 1903, two days before the match. The Birmingham Evening Despatch said Bentley saw the event “as the birth of serious Association football in the district”, though the newspaper added that it was the revival of an earlier attempt by the Home Park Club, but on sounder lines. The article contained a brief account of football history in Plymouth and pointed out that the most famous team to play in the area was of Midlands origin, the South Staffordshire Regiment “who figured prominently in the contest for the Army Cup at that time”. They did not mention that the South Staffs lost to the Argyll & Sutherland Highlanders Regiment in the final. In writing of Argyle, the reporter accurately states, “The new professional club starts on small capital but is influentially backed”. Immense interest in the match brought a crowd of 15,000 to Home Park. J. J. Bentley said the attendance was the largest seen for a friendly match since the Football League was formed fourteen years before. The match was to foster local interest in first-class association football and it was good publicity for Plymouth Argyle, especially with such a good crowd. In amongst the huge crowd, especially at the banked Devonport end, were the bright red tunics of soldiers amongst the black and white clothes of civilians, which made a pretty picture. Around the rest of the ground, the crowd stood up to six deep behind the wooden railings. The track had been roped off from the pitch and was filled with sitting youngsters up to the wooden railings. A band played selections of music from 2 o’clock to kick-off at 3.30 p.m. and again at the interval. Notts County lined up in their usual black and white striped shirts while Sheffield Wednesday swapped their usual blue and white stripes for a white shirt. The crowd were treated to slick and skilful play, especially by Sheffield Wednesday who had ended their season on the 18th April at the top of Football League Division One. They would be the 1902-03 Football League champions unless Sunderland defeated Newcastle away, also being played on the 25th April. The first half was fast and exciting and the movements were watched with the keenest interest. In the second half Sheffield Wednesday were awarded a penalty but the shot hit the post. Play became faster and even more exciting. Sheffield Wednesday had most of the chances; from a corner, J. N. Mallock headed them 1-0 up, ten minutes from the end. They kept up the attack on Notts County until the final minute when Ruddlesden scored with a 25-yard shot to put 'The Blades' 2-0 up. Mr. Strawson blew to end the match with Sheffield Wednesday as the worthy winners of the Argyle trophy. Their afternoon was doubly fruitful as Newcastle defeated Sunderland 1-0 to make Sheffield Wednesday the Football League Champions. This was the first and only time in over one hundred years that a team has won the Championship of the English top division whilst playing at Home Park. The cup was not presented to Sheffield Wednesday until the evening at the Theatre Royal, during the interval of the pantomime 'Bluebeard'. The teams and officials had been invited to the performance by the new proprietor, Arthur Carlton, who was a member of the Argyle Athletic Club and Vice-President of Crownhill. All the players grouped on the stage for the award ceremony. J. J. Bentley made a speech in which he praised Plymouth, the match and Clarence Spooner, his host. He then presented the cup to Ambrose Langley, the captain of Sheffield Wednesday and gold medals to the players. The large audience gave a hearty three cheers to both teams. The Sheffield Wednesday Secretary, Eric England, is holding the 'Plymouth Bowl' won by his club in 1903. Visiting Plymouth Argyle Directors noticed the cup in the Boardroom on the 23rd September 1978, when Argyle were at Hillsborough for a Football League Division Three match. * Argyle and Stoke records show their 4-4 draw as a win to Argyle and loss to Stoke as per a Devon F.A. ruling after Stoke fielded an unregistered player. As all matches had to be played by the 30th April, most of the remaining fixtures were not played. Argyle's record is correct except Goals Against should be 22. The success of the ‘Big Match’ augured well for Plymouth Argyle next season; it was also a good day for the Argyle Football Club this season. After the end of the trophy exhibition match, Green Waves played Defiance in their Devon League match, which had been moved to Home Park. 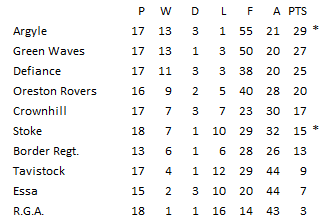 A win by Green Waves would put them level with Argyle with one match each to play. The match started well for Green Waves who led though a Daker goal early on. Defiance equalised. A large crowd had stayed on for this game and they encroached onto the pitch, temporarily stopping the game. The second half started with honours even at 1-1, though not for long as Defiance went ahead 2-1. Immediately after, Daker, the North Lancs Regiment soldier playing for Green Waves, fell heavily whilst about to shoot, breaking his ankle. He was carried off and taken to hospital. With a man advantage, Defiance did most of the pressing, which lead to a goal by Robert Flanaghan to put them 3-1 ahead. Green Waves suffered a second player injury and ended the game with only nine players and a 3-1 defeat. The Western Daily Mercury (27-4-1903) said if they lost, Argyle were League champions but the table printed in the Western Evening Herald on 28th showed if Green Waves won and Argyle lost their final games, Green Waves could have toppled Argyle on goal average. If there was any doubts who were the Devon League 1902-03 Champions, Argyle emphatically settled the issue in the last match of the season and the last in their history as the Argyle Football Club. The final fixture was played at Home Park on Wednesday 29th April 1903 against the Crownhill-stationed 1st Battalion Border Regiment. Argyle fielded their first choice XI whilst the soldiers turned up a man short. There are grounds for suspicion of assistance, as there had been with other clubs in other seasons. No sooner had the game started, one of the Border backs handled to give Argyle a penalty, which Hare converted. From there, the Western Daily Mercury said Argyle “showing magnificent form, simply toyed with the soldiers”. Argyle scored eight goals in the first half, including one of the Border Regiment defenders kicking into his own goal. In the second half Argyle, showing less inclination, scored another three goals to win 11-0. Charlie Hare allowed some indulgent player repositioning, with fullback Sid Wyatt playing inside-right for once in his career. Sid scored one of the second half goals, the only goal of his Argyle Football Club appearances. Of the eleven players, seven different players scored. Percy Buchan, in goal, was playing his last match before retiring from association football. He enjoyed his second half, amusing all by “indulging in some fancy work”. Buchan continued playing cricket and was again captain of the Argyle Cricket Club during the summer of 1903. Charlie Hare also played. Whatever shenanigans went on in Devon Association football, there is no doubt that Charlie Hare’s Argyle Football Club were the deserved 'double' winners. They were acknowledged as the best team, civilian or Forces, to have ever played in the local game from the earliest time up to the end of the 1902-03 season. The Western Daily Mercury on the 4th May 1903 said “Much of the honour of these results may safely be attributed to the genial influence of the Argyle-coach, C. B. Hare, who has not only been the pivot of the team and has instructed the men in the art of the game, but has always, by example and precept, endeavoured to foster correct and “clean” football”. It was intended that the nucleus of the team would continue into the following season as ‘Plymouth Argyle Reserves’ and for that side to continue wearing the Argyle Football Club green and black quartered shirts. Since 1886, the Argyle Football Club had not lived up to expectation but finally in one great season, they had surpassed it. How wonderful for the incoming signed professional players to see the two trophies in the club cabinet and know that Plymouth Argyle was not a new club; it had a proud history. Back row: Charles W. Bishop (Hon. Secretary), John 'Percy' Hooper, Percy N. Buchan, Sid J. Wyatt (Captain), John 'Jack' Jaques (Commitee). Middle row: Robert Wilson (Trainer), John 'Jack' Vivian, Tommy Broad, Clifton Pethick (Vice Captain), Vic Matters, William O. Clemison, Clifford Vivian (Trainor). Front row: Archie Wheaton, Ernest J. Moore, Charlie Hare (Professional Coach), Johnny Andrews, William 'Jacko' Matters. As the day of the Southern League meeting approached, it was unofficially accepted that Plymouth Argyle being voted in was a ‘done deal’. Fulham and Watford accepted that they were fighting for the runner-up spot. Watford were in a perilous financial position and Fulham had only become a limited liability company recently and ambitiously acquired first-class players for the 1903-04 season. On the day before the elections the Southern League held an informal meeting of club delegates, at which a show of hands was in favour of Plymouth Argyle and Watford. In the evening Plymouth Argyle and Fulham hosted a dinner on behalf of the other delegates who toasted both applicants. Thanks to Windrum, Argyle did not need to influence the other clubs, but the Fulham Secretary, realising the likelihood of his club not being voted in, used the dinner to impress their claims upon certain wavering delegates. The Western Daily Mercury on Monday 1st June 1903 reported: "The Southern League Annual Meeting – Admission of Argyle: Mr. W. H. Lawson, presiding over the annual general meeting of the Southern League at The Mitre, Chancery-lane, London on Saturday afternoon (30th May), there being a large attendance of club delegates. The agenda was taken through with commendable despatch, and by far the most important business was the filling of vacancies in the first division. Brighton and Hove Albion were included by virtue of their success in the test match, and this left two places to be filled. There were three candidates in Plymouth Argyle, Fulham, and Watford, the last named having been in the first division last season. The motion to increase the division from 19 to 20 clubs was rejected, and on a ballot being taken Plymouth Argyle received 33 votes, Fulham 22 votes, and Watford 13 votes. Plymouth and Fulham thus complete the first division, and Watford retire to the second, to which they were subsequently elected." The Fulham Secretary had turned round the expected result and gained his club their place in Division One at the expense of Watford. The election wounds of Watford were still evident two years later as they still accused Fulham of “drawing the veil” over the shady dinner where “forces were brought to bear”. It was never an issue that a previously unknown distant amateur club turned professional and, as Plymouth Argyle, jumped straight into Division One in preference to two established London area clubs, both of whom would have been hard done by to fail. Following the election, John J. Bentley (President of the English Football League, and Member of the F.A. Council) wrote to the new Club, “I was pleased to see you had such a big vote for the Southern League. There seems to be every prospect of Football making great headway in Plymouth. There is no doubt about the enthusiasm judging from my brief experience, and the Team you have secured should well hold its own in the Southern League”. On Saturday 13th June 1903, at the Western League Annual General Meeting, Plymouth Argyle, receiving 11 votes, were elected over New Brompton's 4 votes to take the place of Millwall. There were no demands from the member clubs for inducements to be paid, as there had been in the Southern League. Frank Brettell, in attendance to put forward the case for admittance, told the assembly that the Albion Rugby Club were rumoured to have a fixture card of the Southern League matches and were purposely arranging attractive matches to coincide with those at Home Park and were reducing entrance to 3 pence. Albion were furious at the allegation and a few days later Brettell publicly apologised. When Albion’s 1903-04 fixtures were released, there were many clashing ‘home’ fixtures as rumoured. The Plymouth Rugby Club also arranged their ‘home’ matches on the same dates. Argyle had a battle on their hands with their rugby rivals. The Devon F.A. also sought to change its competition rules to limit Plymouth Argyle professional players’ involvement in the local League and Cup. Frank Brettell sought to influence the decision. Though Brettell was appointed Manager on the 2nd March 1903, he worked with no contract until an agreement was signed on 29th June 1903. Lieutenant Windrum had done his work well. Albert E. Webb, the manager of Chubb’s Hotel where many of the formative meetings of Plymouth Argyle Football Company Limited took place, wrote, “Lieutenant Windrum was outstanding. His zeal and wide experience were a tower of strength to the infant club”. Frederick Windrum remained a Director of Plymouth Argyle up until and including the 1906-07 season. His rank became Captain by promotion on the 7th January 1906. In 1910, he was living in Exeter and by 1915, Major Windrum had moved to London becoming the District Officer, Divisional Troops at Woolwich. He retired in 1920, having been given the rank of Lieutenant Colonel. Windrum carried out the duties of Mess Secretary at the Royal Artillery, Woolwich from 1915 to his death in 1952, aged 89. In the summer of 1903, the arrival of Plymouth Argyle on the professional league scene was eagerly anticipated and its developments reported widely in the press, so much so that new clubs soon began to spring up with “Argyle” in their name, particularly in Portsmouth, home to Point Argyle, Portsmouth Argyle, and Palmerston Argyle. Thus, the legacy of the Argyle name was handed over to the new professional League club. After two manifestations, stretched over seventeen years, the Argyle Football Club history ended under that title. Survival at times was by a mere thread but the club made it through fifteen seasons, the final two being of epic proportions. 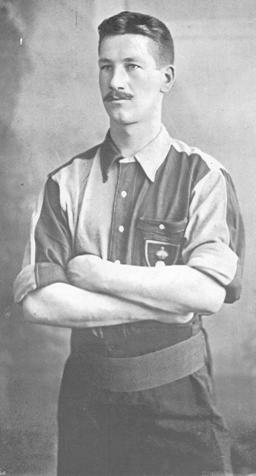 Clarence Spooner’s involvement with Argyle began as a young man playing on the 11th January 1893. Nearly sixty years later, and in his eighties, he was President of Plymouth Argyle in the 1951-52 season.